Red Lips and Rosewater: Beauty Haul! As March has officially come to a close and we are now well into April (where has the time gone?!) I figured it was probably time to get around to doing my March Beauty Haul, with a few early April purchases thrown in. I got some great deals this past month, some which are still continuing, so I'll make sure to point them out in case you want to get your hands on anything you see! Above are the products en masse, but I'm going to break them down into categories to do them better justice! Let's get started! After going a little crazy on the Barry M Gelly's back in February, I tried to tone down the nail polish purchases this month. But some were simply too pretty to turn down! Barry M Caspian (£3.99): From the Aquarium Collection, Caspian is a stunning rose gold duochrome. Having jumped on the rose gold obsession bandwagon as of late, this one needed to be added to my collection. butter London Cheeky Chops (£12.00/C$17.00): I got this pale yellow for a great price during the CutECOsmetics stock clearance. I love that its bright but not your typical banana yellow...so perfect for spring and summer! Cheeky Purple Haze (£7.00): I blogged about this one in my "April Lust List" post, and I couldn't resist the temptation. I think this lilac grey is so sophisticated and a great year-round colour. H&M Starstruck (£2.99/C$5.95): One of my favourite polishes ever is butter London's Black Knight, which I have tried to steal from my sister to no avail. I picked up Starstruck hoping for a a similar effect, all though my hopes weren't too high as the price was quite low. On further examination I don't think Starstruck will match the opaque glittery awesomeness that is Black Knight, as it leans towards the sheer side of things but it certainly is glitzy and might work well as a top coat over a black creme polish. Blushes seem to be my new thing lately. I've never paid much attention to them before, but recently I've been drawn to them like never before! I did my research before ordering two blushes, one a cream and one a powder. Stila Convertible Color in Petunia (£16.00/C$33.00): I've heard a lot of good things about Stila's Convertible Color creme blushes. They can be used on lips too, but I think I'll keep this peachy pink colour to my cheeks to give me a subtle spring-ready glow. H&M Kabuki Brush (£2.99): This little guy was an impulse purchase, because it was cheap and had a pretty rose gold handle. H&M brushes haven't served me very well in the past, but maybe this one will be different? Here's hoping! It was a MAC month for eyes, and although I didn't make many purchases (my eyeshadow collection needs to be culled), I'm excited about the ones I did pick up. MAC Mineralize Eyeshadow in In the Meadow (£17.00/C$25.00): Part of the Fantasy of Flowers collection, which came to the UK later than it did in North America, In the Meadow is a single pan quad of four earth toned shades: an iridescent silver, a pale yellow-gold, a green-tinged brown, and light green. Save for the silver, I don't have any of these in my collection, and have been searching for a green that wasn't too over the top for a while. I can't wait to try these out together! MAC Liquid Last Liner in Point Black (£15.00/C$23.00): This is my holy grail eyeliner, and is becoming increasingly hard to find as the rest of the Liquid Last Liners have been discontinued. It isn't available in my local MAC store, so when I spotted it at Heathrow Duty Free I grabbed it immediately. It's so easy to use and lasts forever on the eyelid...I don't know what I'll do when the day comes where I can't find this beauty! I went a little lip-product crazy this month. While some were great deals that couldn't be resisted or products that I've had my eye on for a while, I was also on a hunt for the perfect purple lip, and ended up with two! Korres Lip Butters in Wild Rose and Pomegranate (£8.00/C$16.00): I picked these up for £4 a pop during the CutECOsmetics sale, and I couldn't be happier. Everything about these is just so lovely: they have the texture of a moisturizing balm and offer sheer but buildable colour. Wild Rose gives you that just-bitten red hue that we all wish we had naturally, and Pomegranate provides a pink-coral wash of colour. Highly recommended! Too Faced La Creme Lipstick in Jelly Bean (£18.00/C$26.00): Oh, Too Faced La Creme Lipsticks. I cannot sing your praises enough. The La Creme formula is my absolute favourite: it is SO moisturizing, has great stay-power, and offers true to pan (tube?) pigment. This rich raspberry shade is a new release, and is the perfect bold summer lip to chase away your winter blues. Kiehl's Lip Balm #1 in Mango (£9.50/C$11.00): This is an old standard in lots of cosmetic bags. The Kiehl's Lip Balm #1 is a colourless, glossy balm that has a delicious mango scent and offers hydration and shine to your lips. A simple oldie but goodie. Sleek Cosmetics Matte Me Lip Cream in Fandango Purple (£4.99): This was purchase #1 on my purple lip quest. The Sleek Matte Me formula is true to its description: it offers a pop of colour with staining power and a matte finish. Fandango Purple may not be an everyday colour, but it certainly is a statement lip, staining your pout a bright magenta-purple. If you like matte finishes and stains that don't budge, check this one out. Just be sure to apply with a mirror, because it does not come off easily! butter London Lippy in Primrose Hill Picnic (£14.00/C$19.00): I already blogged about this one in my butter London Lippy review...in short, a lovely glossy pink that is neither sticky nor tacky and has great wear time! The Body Shop Colour Crush Lipstick in 240 Damson in Distress (£10.00/C$13.00): I am a huge fan of The Body Shop Colour Crush Lipsticks. I love the faint rose scent, the emollient texture, and the colour payoff. I was ecstatic to find this purple of my dreams. Damson in Distress (the name is only printed on the plastic seal, so look for 240 for reference) is a wine purple that is both dramatic and wearable. Think Lorde's signature look! The majority of my body purchases were from the AMAZING 40% off (and then some!) sale that has been happening at The Body Shop over the last week and is still occurring online and in stores, with extra savings for members. Go check it out as fast as your legs can carry you...you won't regret it, and your wallet will thank you! The Body Shop Body Butters in Papaya and Cranberry Joy (regular £13.00, on for £5.00/C$20.00): Body Butters have a cult following, and if you've never tried them, you absolutely have to...they are non-greasy, incredibly moisturizing creams that smell amazing. I was so excited to find these two in stores, because Papaya is a limited edition scent that is usually only available online and Cranberry Joy is a Christmas release that I was kicking myself for missing late last year. Papaya is the perfect tropical fruity scent for the warmer months, and I plan on saving Cranberry Joy for the chillier seasons when its zingy notes will be a perfect pick me up. The best part? These full sized products were £5 (less with a membership)!!!! Marks and Spencer Aromatic Shower Gel in Seamoss (£3.00): Lately I've been stockpiling shower gels...you can never have too many, right? This Marks and Spencer line is super inexpensive and smells amazing. I love the fresh aquatic scent of this shower gel, and am also intrigued by the moisturizing properties it claims to have. For £3, it was a steal for sure! The Body Shop Body Scrub Mini in Pink Grapefruit (£5.00/C$6.00): I'm pretty picky about my Body Scrubs: I like a lot of exfoliating power in my potted scrubs, and usually look for a softer bead in my body polishes. I've never tried The Body Shop scrubs before, so I picked up the mini as a tester. The Grapefruit scent is one of my favourites. It's zesty and citrusy and wakes up the senses! Even if the scrub is a miss, at least I'll enjoy breathing in the scent of grapefruit in the shower! The Body Shop Shower Gel in Passion Fruit (regular £4, on for £3.00/C$9.00): This is another one of those limited edition scents that were previously online only. Adding to my shower gel stockpile, I picked up this rich tropical scent that is slightly less sweet than its papaya counterpart. And for £3, who could resist? That's it for this past month's beauty haul! What have you slipped in your shopping basket lately? I will take it all!! LOL What a great haul! I definitely want to try that butter London Lippy soon! 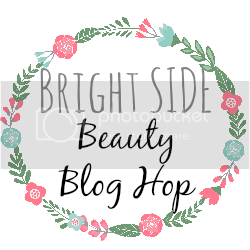 Following from the Bright Side Beauty Blog Hop via GFC. Follow me here @ Beauty By Jennafer if you would like!